The Elizabeth Newson Centre is a facility for the families of children with any developmental communication disorder, and is designed to help parents obtain a specialist diagnostic assessment of their child as early as possible, so as to move towards focused intervention without delay. Children are seen across the age range, but we may need to adapt procedures for those of secondary age. Our service now extends to the age of 25. 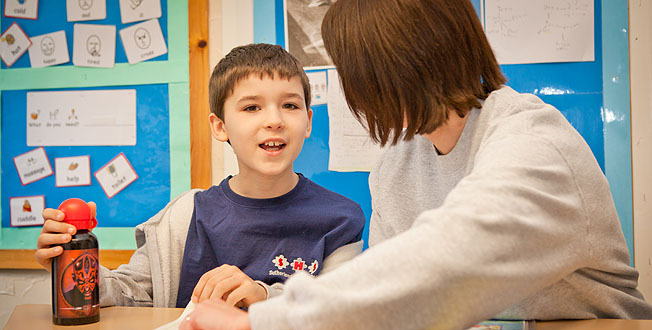 The Centre is able to provide comprehensive assessments across the full range of communication disorders and has particular clinical and research experience in very early intervention, Pathological Demand Avoidance syndrome and counselling approaches for children and young people with Asperger’s syndrome. Why do families need a diagnosis? In a diagnosis we map out the child’s special difficulties, begin to explain why he or she behaves in the way he or she does, work out what are the child’s strengths, and use all the guidelines that exist to think about how he or she can be helped. Some children are not quite typical of any one diagnostic category; even then, it is possible to set out in what ways the child does and does not conform to a particular diagnosis, and what the implications are for him or her. Our aim to always to make better sense of the child in order to actively aid his or her development. The better parents understand their child and his or her condition, the more capable they will be in meeting the difficulties that arise. This is why partnership between parents and professionals is so crucial. Children with different diagnostic profiles will need different emphasis given in relation to educational approach and management. Increasingly, this is being recognised nationally and the Autistic Spectrum Disorders: Good Practice Guidance (published by the Department for Education and Skills and the Department of Health, in 2002) points to a number of sub-groups within the autistic spectrum [here used synonymously with pervasive developmental disorders]. There are differences between the sub-groups and further work is required on defining the criteria. It may be necessary to adopt specific strategies in relation to particular areas of difficulty in order to assist a child to maximize their potential and preserve their dignity. What happens in a play-based assessment? The diagnostic assessment is based on observation and analysis of a total of approximately four hours structured and unstructured play with the child. Two hours of this takes place in a specially equipped playroom and will be observed by parents and professionals together, through a large one-way screen; parents and child have as much access to each other as is needed to keep the child happy. During this time, we also take a comprehensive past and present history. During the second session, the child is also observed in our adventure playground, or in and around the Centre and attached school. After a short break, parents and staff use this time to ask further questions and discuss some of our conclusions. We try to ascertain both immediate and long-term concerns of parents in order to respond to these and we also offer advice on educational provision, and on the needs that should be included in any other assessment that may be in progress. A great deal of information is gathered on the day which then needs to be carefully studied to look at supporting evidence for the diagnostic opinion. This is written up in a comprehensive report, in which the child’s strengths as well as his or her difficulties are assessed. The diagnosis is fully explained in detail, including what this would mean from the child’s point of view, together with any relevant implications. All of the above is written up in a detailed report, which will normally be completed within 6/8 working weeks. It is open to parents to follow up this report by letter or phone if they wish, without any time limit. We also offer parents as much additional written information as they want, and can recommend support groups and other information sources where necessary. The report is circulated both to parents and to the referring professional, and to all relevant persons involved with the child, with parents permission. What about professionals already involved or about to be involved with the child? Before the assessment takes place, we will seek parents permission to ask for reports from their various professionals. This helps to give us an important perspective on how the child has been perceived in the past and any issues of current significance. We very much welcome any professional accompanying the family on the assessment day, provided the parents are happy with this. Can the Centre carry out other forms of assessment? Increasingly, we are being contacted by Local Authorities or CCGs, to carry out assessments of a child in their local area. This usually involves observing the child in school or other settings, discussions with parents and staff, and feeding back through a multi-agency meeting. This can also be followed up by bespoke training. How is a child referred? Anybody can make an initial referral of a child to the Centre, including parents direct. However, since the referral eventually needs to be supported by professional referral and funding, the best means of doing this is likely to involve referral by the family doctor, a paediatrician, or another professional. The Centre can offer advice on courses of action in individual cases. Our fees are based on the costing of our work which involves the assessment being led by a Practitioner psychologist who is supported by two assistant psychologists.’ On occasions members of the Speech and Language Therapy team also contribute to the assessment. Fees are most usually paid either by NHS commissioners or Local Authorities. Occasionally other sources of fees (for instance, medical insurance) might be appropriate, and on occasion parents have found a charitable trust fund to sponsor their child. In some instances, independent assessments are considered if accompanied by a professional referral. What other activities does the Centre undertake?